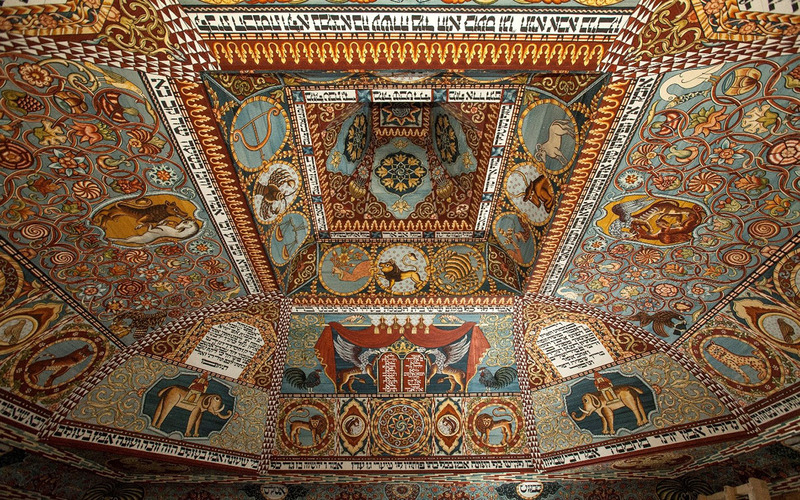 Reconstructed ceiling of an 18th-century synagogue that once stood in Gwoździec, an exhibition centerpiece at POLIN Museum of the History of Polish Jews. The 2017-18 Holocaust Living History Workshops (HLHW) continue this January at the University of California San Diego with six profound lectures focusing on the roles of memory and justice in the process of renewal following the persecution of countless individuals during the Holocaust. The 2018 speakers will remind us that these concepts constitute the threads that run through the tapestry of a history that is tragic yet also inspiring. Co-hosted by the UC San Diego Library and the UC San Diego Jewish Studies Program, the HLHW lecture series invites members of the public and campus community to attend the events to hear personal stories and memories from Holocaust survivors, witnesses, relatives, and scholars. The goal of the program is to broaden understanding of the past, foster tolerance, and preserve the memory of victims and survivors of the Holocaust while emphasizing their continued relevance in the world today. All events are free and held on the UC San Diego campus in Geisel Library’s Seuss Room from 5:00 to 7:00 p.m., with some exceptions (as noted below). The first event this winter will be held on Wednesday, January 17 featuring William Lerach who was part of a small group of American lawyers who, decades later, exposed the widespread complicity of major Swiss banks and multi-national German corporations in the Holocaust. Lerach will discuss the litigations that recovered stolen property worth several billion dollars. He’s also a member of the United States Holocaust Memorial Council, and is the recipient of the prestigious Legacy Laureate Award from the University of Pittsburgh. Patrick Patterson, a professor of history at UC San Diego, will provide an introduction and comments. On Wednesday, February 7, the HLHW series will feature UC San Diego professor emeritus Martin Haas who will share the tragic history of his family’s death and his experience in court where he came face-to-face with the man who was involved in his family’s murder. Haas was born into a Dutch-Jewish family and spent World War II in hiding with a Catholic family. In 1946, he was adopted by a distant relative and emigrated to Israel. Years later he moved to California to pursue a Ph.D.
An extraordinary tale about human rights and their adversaries sits at the heart of Philippe Sands’ book, East West Street. A professor of law and director of the Centre on International Courts and Tribunals at University College London, Sands is a regular commentator on the BBC and CNN and writes frequently about international law for leading newspapers. He was prominently featured in My Nazy Legacy, a documentary released in 2015. This event will be held in the Hojel Auditorium at 7:00 p.m. with a reception and book signing to follow. Copies of East West Street will be available for purchase at the event from Warwick’s. RSVP is required at hlhw_sands_eventbrite.com. San Diegan Michael Bart narrates his parents’ experience as members of the Jewish resistance group, the Avengers of Vilna in Lithuania at the end of WWII. In his award-winning memoir Our Last Breath: A Holocaust Story of Love and Partisan Resistance, Bart recreates his parents’ remarkable story of love and survival in the Vilna ghetto. A decade later his wife Bonnie completed a visual companion piece, Nekamah Freedom Fighters, a documentary based on the journeys to Lithuania, interviews with eye-witnesses, and research from the UCS Shoah Foundation’s Visual History Archive. At this workshop, the couple relates the genesis and experience of how this double project came about. This lecture explores the creation of Warsaw’s POLIN Museum and its multimedia narrative exhibition, Journey of 1000 Years, and the potential to be an agent of transformation that can move an entire society forward. Barbara Kirshenblatt-Gimblett is chief curator of the Core Exhibition at POLIN Museum of the History of Polish Jews. This event will be held in the Atkinson Auditorium at 5:00 p.m. RSVP details to follow at library.ucsd.edu/blogs/events/rising-from-the-rubble. Eva Clarke was one of three “miracle babies” who saw the light of day at the concentration camp of Mauthausen in Austria. Nine days after her birth, WWII ended. As a newborn, Clarke’s chances of survival were extremely slim. Against all odds, she lived, making her and her mother Anka the only survivors of their extended family. In 1948, they emigrated from Prague to the UK and settled in Cardiff. At this event, Clarke will share her remarkable story of survival. For more information about the UC San Diego’s Holocaust Living History Workshop, contact Susanne Hillman at HLHW@ucsd.edu or (858) 534-7661.